Photograph: Hannah BourneAncien Cycles is located at 688 N Milwaukee Ave. 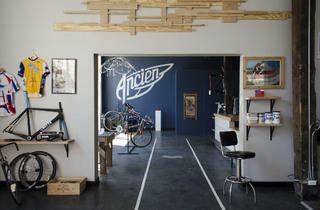 Photograph: Hannah BourneAncien Cylces helps other local bike shops and gear brands by selling in their store. Po Campo is a Chicago shop that sells women's bike bags. Photograph: Hannah BourneCatlike helmets are the top sellers here. Photograph: Hannah BourneOne of their specialty bikes is Ritte bicycles. Photograph: Hannah BourneOne of their specialty bikes is Opus bicycles. Photograph: Hannah BourneAncien Cycles works with Urban Survival Gear that does custom printing slips for your bag. Own a business? Get your logo on your bag to show it off. Photograph: Hannah BourneAncien Cycles specializes in racing bikes. Moots is a new brand that they sell, the first downtown shop to carry Moots. Photograph: Hannah BourneAncien Cycles gets their name from a finisher of Paris-Brest-Paris, a 1200 Kilometer time trial held in France every 4 years. It is the oldest cycling event in the world. Photograph: Hannah BourneAncien Cycles also does in house tune ups and repairs. 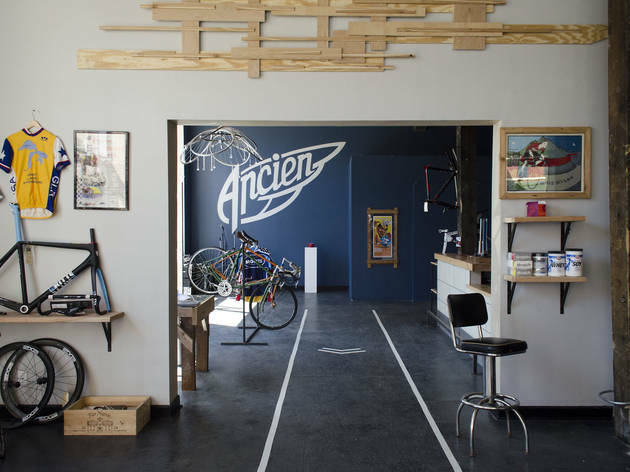 This cool shop, opened by two local bike lovers, stocks bikes from Opus, Ritte, Aluboo and Moots, with a focus on commuter and lifestyle products and bikes. It's located on Milwaukee, which means thousands of bikers ride by each day. Coming in summer 2014: a cafe called Roll Out, with the hopes of making this a major biker hangout. El: Blue to Chicago. Bus: 8, 56.